This card has +1 power for each card beneath it. At the start of the Score Phase, if this card has at least 4 power, you may move it. 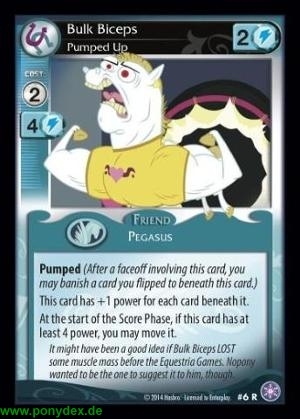 It might have been a good idea if Bulk Biceps LOST some muscle mass before the Equestria Games. Nopony wanted to be the one to suggest it to him, though.